Had a deviation from the hunt for all walleyes all day. we were actually looking for walleyes when we found perch and blue gills (shallow 4' weeds) have to say it is a lot of fun catching pan fish, makes you feel like a kid again. I enjoyed the shore lunch today as much as my five fishing guests from Illinois (tag-a-long boat)often I just have beans, cole slaw and potatoes and onions , I don't want to eat fish 5 or 6 days a week, the perch and blue gills today were some fine dining. We did have time for walleyes we kept 5 released some smaller fish, one 13" crappie in with the walleyes wood in the 12-16' range. 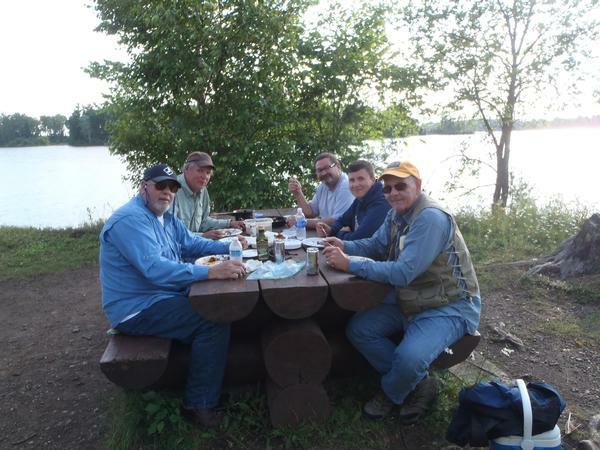 Had a drink after fishing in their cabin at the Deadhorse, very nice accommodations. I've cleaned a lot of fish in the Deadhorse's fish cleaning house but first time launching my boat at their private landing, nice. I'm thankful to have another morning guide trip, but when I noticed the deck of cards and the Tupperware containers of quarters on the kitchen table it was tempting to join the poker game, I declined, that's a winter pursuit. Nice sharing time with people on the TFF it is an awesome body of water.